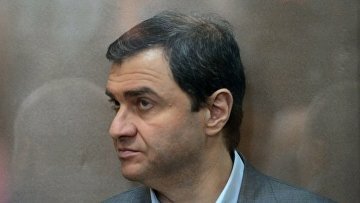 Ex-Russian Deputy Culture Minister Pirumov suspected of $7.3 mln embezzlement | Russian Legal Information Agency (RAPSI). MOSCOW, May 17 (RAPSI) - Ex-Deputy Culture Minister Grigory Pirumov, who had been earlier found guilty of embezzling public funds allocated for restoration of cultural heritage objects, was arrested on suspicion of a 450-million-ruble ($7.3 million) embezzlement, the Investigative Committee’s press service reports Thursday. Businessman Nikita Kolesnikov, who received a 5-year suspended sentence in the so-called case of restorers, has been arrested along with Pirumov. One more defendant in this case is ex-director of the Ministry’s department of property management and investment policy Boris Mazo. According to investigators, they have stolen money allocated for construction of the Hermitage Museum’s buildings. Suspects have organized conclusion of a state contract without intent to execute it. Funds received as a down payment were transferred to firms under their control, investigators claimed. Searches were conducted at the places of defendants’ residence, the statement reads. On December 19, the Moscow City Court toughened punishment for Pirumov. The court imposed a 1-million-ruble fine ($17,000) on ex-official and deprived him of the second-class medal of the Order of Merit for the Motherland. However, prosecutors again filed an appeal against Pirumov’s sentence demanding a 5-year prison term for him. The appeal has been set for May 25. In December 2016, Dmitry Medvedev, the Chairman of the Russian Government, relieved Pirumov of his post.